Evander G. "E. G." Brown, Sr. Celebrating the life of Evander G. "E. G." Brown, Sr.
Be the first to share your favorite memory, photo or story of Evander . This memorial page is dedicated for family, friends and future generations to celebrate the life of their loved one. Obituary for Evander G. "E. G." Brown, Sr.
Evander G. “E.G.” Brown, Sr., 92, went to be with the Lord Wednesday, March 20, 2019. Visitation will be will be Saturday, March 23, 2019 from 10 A.m. until service at 1 P.M. at Central Baptist Church. Graveside service will be at 3 P.M. at Union Seminary Baptist Church Cemetery in Jasper County. Mr. Brown became a member of Central Baptist Church in 1952. He was a former deacon, and was made an honorary deacon for life. 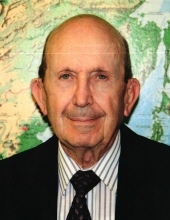 He was a veteran of World War II, and worked at Camp Shelby for thirty years. He was preceded in death by his parents, Hilman and Vina Poore Brown; his first wife, Oma Lea Chancellor; a daughter, Sandy Brown; two brothers, Hilman L. Brown, Jr. and Charlie Brown; and two sisters, Helen Brown May and Elizabeth Ann Brown. He is survived by his wife, Juanita Simpson Brown; a son, Evander G. (Danny) Brown, Jr; a daughter, Debbie Brown (Curtis) Gibson; a step-daughter, Pamela Simpson (Jeff) Autry; six grandchildren, Brandon (Chelsea) Brown, Stephanie Simpson, Sandra Barra, Amy (Alan) Pruvot, Christy (Ricky) Williamson, and Jennifer (Coy) Napier; two step-grandchildren, Lee (Brandi) Odom, and Dr. Danielle (Derrick) Blakney; fourteen great grandchildren; seven step great grandchildren; three great great grandchildren; two brothers, Bill Brown and Donald Brown; and sister, Clara Jane Brown Jackson. To send flowers or a remembrance gift to the family of Evander G. "E. G." Brown, Sr., please visit our Tribute Store. "Email Address" would like to share the life celebration of Evander G. "E. G." Brown, Sr.. Click on the "link" to go to share a favorite memory or leave a condolence message for the family.